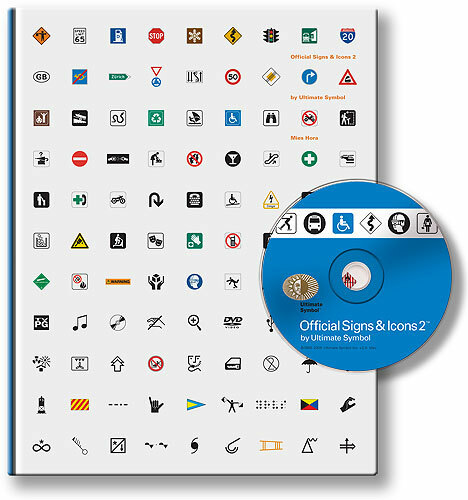 For those of us who have to deal with symbols and icons on a regular basis, and there can’t be many of us who don’t nowadays, Mies Hora’s new publication Official Signs and Icons 2 is a wonderful resource. It comes both as a book and a CD (containing outline EPS files) which you can buy separately or as a set. In eleven chapters, it brings together in one volume, pretty much every symbol you will ever need to wrestle with, including highway and transportations signs, safety symbols, recreational symbols and some nerdy stuff for electronics, computers, meteorology, and labelling. Most fun is the chapter which shows each character of the alphabet in signal flags, semaphore positions, Morse code, American Sign Language, and Braille. There have been several such books published from time to time since Henry Dreyfus’ 1972 Symbol Sourcebook, which still contains the most fascinating and esoteric selections, such as hobo signs. But for symbols with everyday applications, if you aren’t planning to jump a freight train, Mies has excelled himself in putting together this exhaustive collection (although I must admit I gave him a little help with some of those relating to accessibility). Your CD-ROM sounds quite a thing! How can one obtain it? I live in India and i haven’t seen it at any book shop out here. Do help. regards, amit.